Summary: Naturopathic Doctors, Rudy and Jeanie Davis, present health reform in a refreshing, easy to understand way. 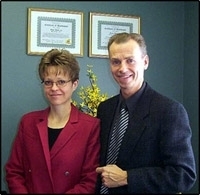 Naturopathic Doctors, Rudy and Jeanie Davis, present health reform in a refreshing, easy to understand way, which helps people see not only the blessing of the Health reform message but also its role as part of our end-time message. Their multi-media presentations take you all the way from how we get sick to how we can get well with principles from Holy Writ, the Spirit of Prophecy and numerous testimonies from their years of personal experience in helping people to recover their health.